Are some auto makers starting to produce "recession cars"? Perhaps I'm being overly pessimistic in asking this question, but there is some evidence to support this thinking. For a start, there is the reception Honda's all-new 2012 Honda Civic is getting, which seems to indicate that the 9th generation Civic is a step down in terms of quality. Perhaps Honda just got it wrong, but there is evidence of cost cutting on the Civic, in a segment of the market where rivals are stepping up their game. The Chevrolet Cruze, for example, has overtaken Honda and Toyota in sales figures in the US. Chevrolet is enjoying these gains because they are offering better value for money. The Cruze is also proving to be a hit in Thailand, thanks to competitive pricing and good standard specification. But what has any of this got to do with Toyota and the whole Yaris/Vios/Etios story? If you do chose to go down the "recession car" route -making basic and lower cost vehicles- there is another way to approach this task. You can introduce a completely new car and replace an existing higher cost vehicle with a new lower cost option. Nissan did this when they introduced the Tiida and phased out the Sunny. What is that? I know, I know, it's not much to look at, but it does have a happy face! The smile on the face of this little car is not the only cheery thing about it. 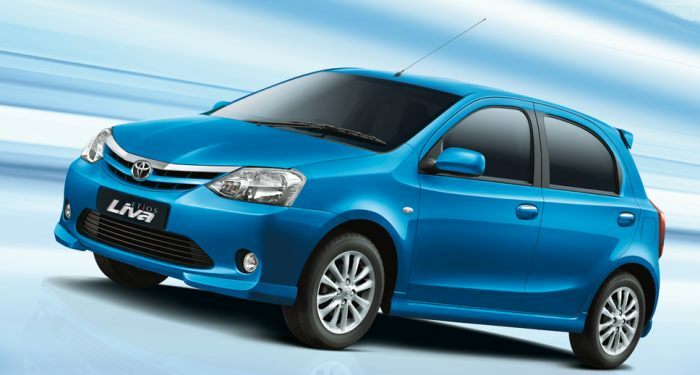 This is the Toyota Etios Liva (say lee-va). It is a low-cost car currently attacking the Indian market. This type of car will not appeal to everyone, but the Etios should hold its own against the likes of the March, and Brio. While the styling is not fantastic, I personally think it is slightly less feminine looking, and might win over a few more male drivers than the somewhat girlie Honda Brio and Nissan March. The Etios is not pretty, and the interior is also a little bit awkward looking, but for those looking for cheap, honest transportation, this little Toyota will fit the bill. And let's be realistic here. Thailand needs more cars exactly like this. When I first heard about the Toyota Etios it was only in booted form, and I wrote that it was unlikely to replace the Vios. But, a lot of things have happened in the time since. But, why would Toyota drop the Yaris and replace it with an inferior car? For a start, who said this car is inferior? Any car package is assessed in context of its pricing. While the Yaris was already struggling against the similarly priced -but better appointed- Jazz, Toyota's sales in the small car market were further eroded by the introduction of the Nissan March. Even the Honda Brio, which itself is no-doubt cannibalising some Jazz sales, can be seen as a lower cost alternative to the Yaris, and you would struggle to find arguments to justify the Yaris when compared to these eco-car options. The success of the Nissan March, and Honda Brio serve as proof that eco-car sceptics (of which I was one) failed to realise that there is a demand for cheap new cars regardless of how basic they are. The Etios would allow Toyota to tap into that market in direct competition with the Brio and March, in the new small car segment. But, couldn't the Yaris qualify for the eco-car project? Another possibility that has been floated by some: a Yaris eco-car. This is actually not such a bad idea. The Yaris is not a whole lot bigger than the March, or the Etios, and Toyota could elect to drop in one of their smaller engines in order to achieve the CO2 requirements of the eco-car project. However, simply qualifying for the eco-car status would not be sufficient to bring the price point down to competitive levels. The 2012 Yaris would simply not be price competitive with the March and Brio. And from my understanding of the requirements for eco-car qualification, using an existing model would not be allowed, so the current Yaris could not be used as an eco car. The Etios seems like the more obvious fit, thanks to the 1.2 litre engine, and although the dimensions are almost identical to the current Yaris, the Etios is cheaper to produce. It is possible that Toyota will keep pumping out the Yaris and Vios for as long as they can keep moving them through the showrooms, but the 2012 Yaris might never make it to Thailand. And I'd say that's not exactly a big loss! I haven't driven an Etios yet, but on paper, and from what I've seen of it in video reviews, it looks like an honest-to-goodness, no nonsense, A-to-B car. Nobody really needs anything more than that.